The Sea Crest Oceanfront Resort offers a perfect blend of affordable family-sized accommodations, array of amenities, exceptional customer service, and a prime Oceanfront location! 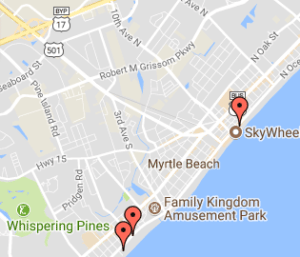 Well known as a family destination, the Sea Crest Resort is centrally located in Myrtle Beach and just a short walk to the Family Kingdom and other popular area attractions. Some of the amenities that set the Sea Crest apart from the other hotels in Myrtle Beach include the 9 water attractions which include indoor and outdoor pools, an outdoor water park with water slide, indoor and outdoor lazy river rides, two indoor jacuzzis, covered children’s activity pool and the pool bar features live entertainment or karaoke (in season). Come meet our courteous and friendly staff as well as enjoy your clean and well maintained room or suite. It’s no wonder that for over 20 years thousands of families have chosen to entrust their family vacation memories to Sea Crest Oceanfront Resort. Our Myrtle Beach Family Resort features 9 generous pool attractions, including: Children’s activity pool with “Freddie The Frog” and a “rain maker” splash area; Two indoor jacuzzis; Indoor pool; Outdoor pool; Indoor lazy river; Outdoor lazy river; Baby pool; Children’s waterpark with slide. Our oceanfront waterpark is particularly popular with guests and features a children’s water slide, in addition to a large outdoor splash area. This interactive play area is full of topsy turvey buckets, mushroom rain makers, and even a large silly submarine that kids can climb into. The water park is near plenty of outdoor seating, making it easy for mom and dad to kick back and relax while the little ones play the day away! Please Note: Our pools are open daily from 9:00 am – 11:00 pm. The indoor pools are open all year! The outdoor pools do close from October 31st – March 2nd. Our slide in the children’s waterpark area is open daily from 10:00 am – 4:00 pm from April 1st – September 3rd. The yellow waterslide is appropriate for children between 32-60 inches tall and under 300 lbs. We do have a children’s activity pool with a smaller frog slide for smaller children. You’ll have a blast at Malibu Beach Bar & Oceanfront Snack Bar! This oceanfront eatery offers a diverse menu of beach favorites that are sure to please even the pickiest palette. Popular selections include grilled burgers and hot dogs, assorted sandwiches and wraps, and fresh fried seafood baskets – to name a few. Malibu also features a tiki style bar that serves up creative tropical concoctions and is a great place to grab a drink to help you beat the heat. Aside from great food and drinks, Malibu Beach Bar is also a great source for entertainment. They host live entertainment and karaoke throughout the season (weather permitting), meaning you will find plenty to keep you busy right here at our pristine oceanfront property. Guests at Sea Crest Resort can begin their day on a high note with breakfast at our Beach Java Cafe. This on-site cafe proudly serves Starbucks® coffee and Starbucks espresso selections, ensuring only the highest quality, in addition to an array of pastries and other light breakfast and snack items. Stop by to grab a cup of joe or a bite to eat before you begin your beach adventures. For those of you that just want to get away, but not from your exercise routine, our newly remodeled fitness center will help our guests stay in shape while on vacation. The fitness center features several machines and plenty of equipment to allow guests a well rounded gym experience. The fitness center also has a TV to keep you entertained while you work those muscles. Looking for that perfect gift? Have a craving for a late night snack? Head down to our Ship Store Mini-Mart and Gift Shop! We have you covered with everything from Myrtle Beach souvenirs to forgotten toiletry items. The Oceanfront Waterpark at Sea Crest Resort features an array of interactive features ideal for hours of fun in the sun! The water slide is over 50 feet in length and the play portion of the water park sports a distinct shipwrecked theme. The children’s play area is complete with mushroom-shaped umbrella rain makers, silly seahorses, topsy-turvey buckets, an interactive shipwrecked submarine, a 50-foot waterslide and an oceanfront lazy river. The water park is a great way to soak up the sun without the hassle of the salt and the sand! And, you won’t have to go far as this family friendly water park is just steps away from your oceanfront accommodations. Please Note: Our pools are open daily from 9:00 am – 11:00 pm – seasonally. The indoor pools are open all year! The outdoor pools do close from October 31st – March 2nd. Our slide in the children’s waterpark area is open daily from 10:00 am – 4:00 pm from April 1st – September 3rd. The yellow waterslide is appropriate for children between 32-60 inches tall and under 300 lbs. We do have a children’s activity pool with a smaller frog slide for smaller children. Don’t miss our daily live entertainment at Malibu Beach Bar & Oceanfront Snack Bar! This outdoor venue hosts a variety of local bands throughout the summer (weather permitting) in addition to scheduled karaoke events that are a definite crowd pleaser. Stop in for a bite to eat after a long day at the beach or grab an ice cold drink from the tiki bar and settle in for a night full of fun! Just ask your reservations specialist for more information about live entertainment events during your stay at Sea Crest! Our partial ocean-view jacuzzi suites consist of one king bed in the bedroom, a separate living area with a double murphy bed (fold down wall bed), full service kitchen including a microwave, stove, and full refrigerator, one bath with a garden tub jacuzzi, 2 TVs, and a private balcony with a northeast view of the beach. These suites are located in the Angle Oceanfront Tower floors 2-4. Each unit includes a hairdryer, iron/ironing board, in-room coffee, in-room safe, and free in-room wireless internet. Non-smoking. Approximate sq. ft. 475. Our partial ocean-view king efficiencies consist of one king bed, a stove, microwave, full refrigerator, and private balcony with a northeast (partial) view of the ocean. These rooms are located in the Angle Oceanfront Tower floors 5-15. Each unit includes a hairdryer, iron/ironing board, in-room coffee, in-room safe, and free in-room wireless internet. Non smoking. Approximate sq. ft. 325. Our oceanfront king efficiencies consist of a king bed in one room with a stove, microwave, stove, full refrigerator, and private balcony overlooking the ocean. Oceanfront king efficiencies are located in the Oceanfront Tower floors 2-15. Each unit includes a hairdryer, iron/ironing board, in-room coffee, in-room safe, and free in-room wireless internet. Non smoking. Approximate sq. ft. 350. Our partial ocean-view suites consist of two double beds in the bedroom, a separate living area with a double murphy bed (fold down wall bed) OR a sleeper sofa, full kitchen including a microwave, stove, and full refrigerator, one bath, 2 TVs, and a private balcony with a northeast (partial) view of the ocean. These suites are located in the Angle Oceanfront Tower floors 5-15. Each unit includes a hairdryer, iron/ironing board, in-room coffee, in-room safe, and free in-room wireless internet. Non smoking. Approx. sq. ft. 475. Our partial ocean-view king suites consist of one king bed in the bedroom, a separate living area with a double murphy bed (fold down wall bed) OR sleeper sofa, full service kitchen including a microwave, stove, and refrigerator, one bath, 2 TVs, and a private balcony with a northeast (partial) view of the ocean. These suites are located in the Angle Oceanfront Tower floors 5-15. Each unit includes a hairdryer, iron/ironing board, in-room coffee, in-room safe, & free in-room wireless internet. Non smoking. Approx. sq. ft. 475. Our oceanfront efficiencies consist of two queen beds in one room with an efficiency kitchen, microwave, stove, full refrigerator, and private balcony overlooking the ocean. Oceanfront efficiencies are located in the Oceanfront Tower floors 2-15. Each unit includes a hairdryer, iron/ironing board, in-room coffee, in-room safe, and free in-room wireless internet. Non smoking. Approximate sq. ft. 350. Our oceanfront queen junior suites consist of a queen bed in the bedroom, a separate living area with a double wall bed and single sleeper sofa, full service kitchen including a microwave, stove, and full refrigerator, one bath, 2 TVs, and a private balcony overlooking the ocean. Oceanfront junior suites are located in the Oceanfront Tower floors 2-12. Each unit includes a hairdryer, iron/ironing board, in-room coffee, in-room safe, and free in-room wireless internet. Non smoking. Approximate sq. ft. 455. Our oceanfront king junior suites consist of a king bed in the bedroom, a separate living area with a double wall bed and single sleeper sofa, full service kitchen including a microwave and full refrigerator, one bath, 2 TVs, and a private balcony overlooking the ocean. Oceanfront king junior suites are located in the Oceanfront Tower floors 2-14. Each unit includes a hairdryer, iron/ironing board, in-room coffee, in-room safe, and free in-room wireless internet. Non smoking. Approximate sq. ft. 455. Our oceanfront executive suites consist of two queen beds in the bedroom, a separate living area with a double murphy bed (fold down wall bed) OR sleeper sofa, full kitchen including a microwave, stove, and full refrigerator, one bath, 2 TVs, and a private double balcony overlooking the ocean. Oceanfront executive suites are located in the Oceanfront Tower floors 11-15. Each unit includes a hairdryer, iron/ironing board, in-room coffee, in-room safe, and free in-room wireless internet. Non smoking. Approx. sq. ft. 655.